Protein is vital for your body’s health. Most teens need to eat/drink 40-60g of protein a day. Protein supplements aren’t necessary if you eat a healthy diet. 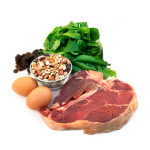 Protein is needed to build and repair your muscles, make hair and skin, fight against infections, and carry oxygen in your blood. Proteins are made up of about twenty different building blocks called amino acids. Your body can make some amino acids, but there are nine that can’t be made (we call these “essential amino acids”), and the only way to get them is through the food you eat. It’s important to eat a variety of protein foods every day to make sure your body gets all of the essential amino acids. Plant foods such as legumes (beans, lentils, and peas), nuts, peanut butter, seeds, and soy foods (soybeans, soymilk, and tofu) are all high in protein. Animal foods such as meat, fish, turkey, chicken, eggs, milk, cheese, and yogurt are also good sources of protein. The amount of protein that you need daily, or the recommended daily allowance (RDA), depends on your age and body size, but most teens need between 40 and 60 grams of protein each day. To figure out exactly how much you need, you’ll need to do a little math. If you’re 11-13 years old: Multiply your weight in pounds by 0.455; this gives you about how many grams of protein you need each day. For example, a 12 year-old who weighs 100 lbs would need about 45.5 grams of protein (100 lbs x 0.455 = 45.5). If you’re 15-18 years old: Multiply your weight in pounds by 0.36 to estimate how many grams of protein you need each day. For example, a 16 year-old female who weighs 120 lbs would need about 43 grams of protein (120 lbs x 0.36 = 43.2). Keep in mind that this is just an estimate. Now that you know about how much protein you should eat every day, it’s helpful to know how much protein is in the foods you eat. For comparison, 3 ounces of meat is approximately the size of a deck of cards. The table below lists some good sources of protein and the grams of protein in each serving. What’s the deal with protein supplements? There are many different protein supplements that come as powders, shakes, and bars. Most Americans get more than enough protein from food; therefore extra supplements don’t have any benefit. Protein supplements don’t increase muscle mass, strength, or endurance – the keys to building new muscle are proper training and eating enough calories. Some protein shakes and supplements may be harmful to your body. Protein supplements are very expensive. Be sure to talk to your health care provider (and dietitian) if you’re taking a protein supplement or you’re thinking about taking one. How often should I eat foods with protein in them? Protein is a filling nutrient, so it’s a good idea to eat some at every meal and at most snacks to feel satisfied and not hungry. Our bodies have no way of storing protein so you can’t eat it all at one meal and assume that your body will have enough at other times. The table below includes some easy ways for you to get in protein throughout the day.